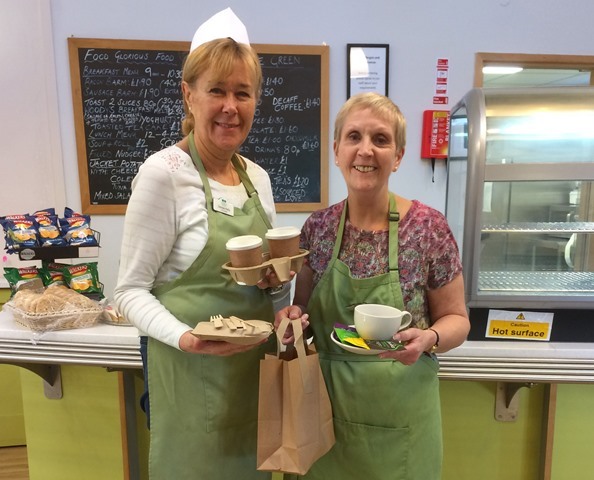 Volunteers Denise and Pat model our environmentally friendly items in the cafe. Our cafe at Woodlands, known as the Green, is renowned as a friendly and comfortable haven for patients and families alike, as well as being home to a number of tasty and healthy snacks and drinks. But recently we have made its name even more relevant by stocking a new packaging and a number of other items that are better for the environment. All take away coffee cups, lids and holders are now fully biodegradable, as well as the paper bags and wooden cutlery. The cafe also stocks Pukka teas, which are 100% organic and ethically sourced. "We now use a number of eco-friendly items and our coffee cups and lids will full biodegrade in just three months. We are actively looking to stock more envi­ron­men­tally-friendly items and expand our range of ethically sourced food." "It's not just about looking after our patients and their families, we want to look after the planet too."